Thursday 9th November 2018 was World Usability Day and Irish design company Frontend.com celebrated by scooping top honours at the prestigious UX Awards Summit in Palo Alto, California. beating stiff competition from around the globe. 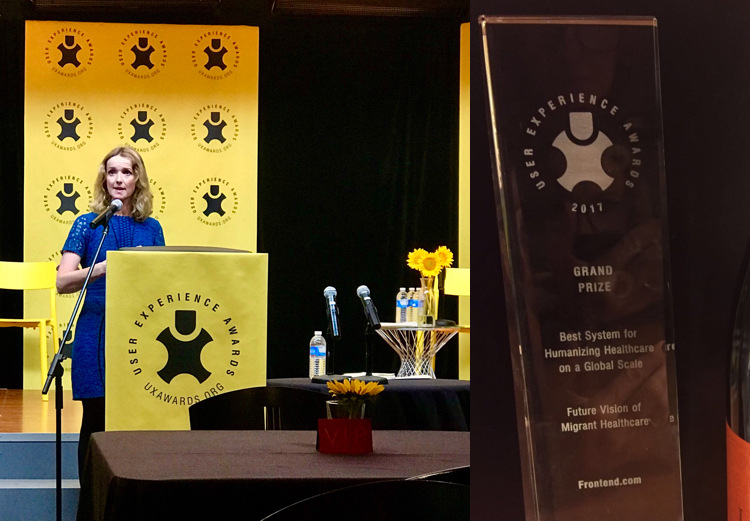 The UX Awards are the Oscars for digital experience design and Frontend.com won the Grand Prize for their work on the Future Vision of Migrant Health Care. The project was carried out in collaboration with the UN International Organisation for Migration (IOM) and also involved students from multiple third level institutions in Ireland. Inspired by the Syrian migrant crisis, the solution explores ways in which technology can help overcome the many challenges facing vulnerable people during their journey. Issues such as language and literacy are addressed, as well as ways to provide remote health consultations with doctors who can volunteer their time from anywhere in the world. The next big step and challenge are turning the concept into reality, Viriri added. “It has been amazing, as a design team, to see the human effect of this work and to have it recognized by our industry peers is particularly special and humbling. It is such an honour to represent Irish design on the world stage, and to be involved with an organisation who are trying to solve such worthwhile human problems,” said Long. Visit Frontend.com/Futurevision for more information about this project. Read the complete awards submission here.